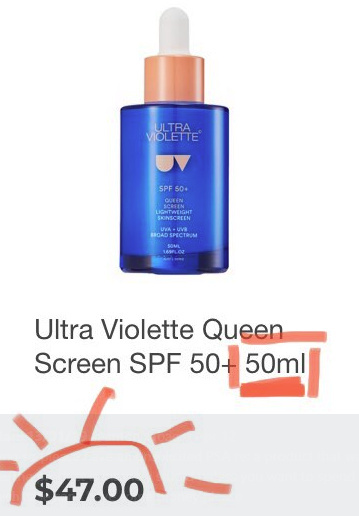 Ultra Violette Queen - is this sunscreen too expensive? What do you think, too expensive or worth it? Glowing reviews, a bit pricey. Among it’s many ingredients there’s Dimethicone: also known as Silicone. At the start of summer I got an anti -pollution, anti-aging, sunscreen from the Cancer Council, similar to a serum plus moisturiser plus 50+ spf. About $30.00 per 50ml. Only got it because my Cancer Council Everyday Face Suncreen (half that price) got Vit E and Aloe Vera added to it, and I don’t like either. A sunscreen has one function, to protect the skin. It is far too expensive when the major supermarkets can sell equal performing 50SPF sunscreen at 100th the price ($9 per litre). While it may not have the same perceived mojo factor, ones skin will look the same after same amount of time in the sun (either direct or indirect exposure). I know where I would rather spend my hard earned dollars (or $100 bills in the case of Ultra Violette). Value is in the eye of the beholder / consumer. If enough people are willing to pay, it is by definition worth it (to them). Is it value for money is another question, but in these days of ‘excessive haves’ as consumers, compared to the more ordinary economic sphere who weigh prices more carefully, it is apparently also value for money as that is not necessarily one of their prime considerations in purchasing. ,Face sunscreens are dissimilar to all purpose ones: most incorporate skin care + the usual mix of UV absorbers and scatterers. More and more they are presented as ‘Anti-aging’ as UV rays are responsible for most of the ageing signs on our skin: sunspots, lines, wrinkles. Which sunscreen would be best for us depends on our type of skin (sensitive, dry, etc.,) and our age: young skins break out if cream is too rich, and older ones would feel dry without a rich moisturiser. There are also appropriate ones for sensitive skins. The Ultra Violette sunscreen has other ingredients besides UV blockers: moisture attracting Glycerin, shiny Mica, smoothing Dimethicone, and many others. Also, as it can be applied by a dropper, it would last longer than a tube which can be squeezed too much. But it looks like it is more of a cosmetic plus sunscreen, and that would explain the hefty price tag. It depends who is paying for it, who it is for, and the quality of the gift wrapping? Are we measuring an intrinsic value or something more meaningful and personal? P.s. would Choice like to take on a blind sniff vs Value test of parfume/cologne/Brutt33! Tweed vs Old Spice, who comes out on top in the Choice members review? Great idea @mark_m, I’m sure that would be an interesting test. The anti-ageing factor is obviously the kicker here, good point @Gaby. Where it becomes a little confusing for me is the messaging on the bottle, but perhaps those who use this brand would understand it differently. Certainly as @phb noted, there are far cheaper products for sunscreen alone. I’ve started a seperate thread on anti-ageing, please head over if you care to add your thoughts. Technically all sunscreen is an anti aging product as it protects the skin from sun damage which cases premature aging. Yep, it’s really not THAT much more expensive than other ‘facial’ suncreens I’ve seen on the market (and isn’t an eye-popping price when compared to a lot of other skincare/anti-ageing products out there). I think there’s a huge demand for these types of sophisticated facial sunscreens from people who wear them daily and have specific skin concerns or wear them underneath makeup. Most supermarket or body sunscreens are very greasy and don’t have a pleasant feeling on the skin (which is why they’re so cheap), so would be awful to apply to your face every day, especially if wearing under makeup. So it makes sense that you’d pay more for something specially formulated to sit on the face or under makeup all day, every day. I haven’t used this product but I would be sceptical of the anti-ageing claims (other than preventative effects of SPF on the skin over time) as there’s not much info out there about the ‘powerful anti-ageing active’ Dragosine Plus, but they do seem to know a lot about SPF. Another downside: they recommend using quite a lot each day - 2-3 full droppers - so, following that advice, you’d go through this stuff pretty quickly! I don’t think it’s worth the price. I think a dedicated facial sunscreen that performs well (probably costing $20-$30) is a better way to spend your money. Would be keen to hear from anyone who has tried it though!